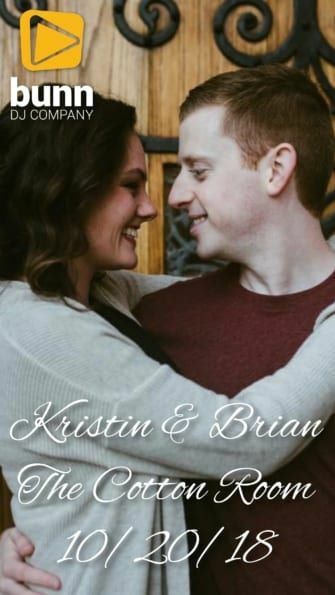 I had never met Kristin and Brian until their wedding day at The Cotton Room on October 20th, but liked them as soon as I talked to them. They are so nice! Their ceremony was held on one side of the room and partitioned by white linens. It is just beautiful with floor to ceiling windows along one brick wall. They had reverend Barbara Lodge (one of my favs!) and I ran a mic for her, one for Brian and one for Kristin’s Aunts who were readers. As the 120 guests arrived I had a mix of contemporary love songs playing. After everyone was seated I started the ceremony music. The Parents entered to a classical cover of “Can You Feel The Love Tonight”. The Bridesmaids to “All Of Me” and Kristin to “A River Flows In You” by Daniel Jang. Her hair and makeup was perfect and done by Makeup by Ashley Mooney. After a short service that also included a remembrance that I played “Thinking Out Loud” during, they recessed to “How Sweet It Is” by James Taylor. They were invited to the cocktail hour in the front of the room by Barbara and I started a mix of rock, classic soul and standards. The staff flipped the room for dinner with help from two of my fav planners, Betsy and Carrington (Yay! Carrington!!) from McLean Events. The room looked beautiful with floral arrangements by Blossoms By Design! After pics were taken by Joanna Sue Photography, the white linens opened and I invited guests to their seats. I left music playing and went to line the wedding party up with Betsy and Carrington. I introduced the wedding party and Kristin and Brian to “Crazy In Love” by Beyonce. They came in to loud applause and had their first dance to and edit I made of the Candlelight Mix of “Everytime We Touch” by Cascada. We had the combined parents dances next to “You’ve Got A Friend” by James Taylor. About ½ way through Brian’s Brothers showed up in chicken suits and joined in for the dance with Brian. It really caught everyone off guard and gave me another wedding moment I will never forget! LOL. They all took their seats and the Fathers welcomed everyone and blessed the meal. The food stations opened shortly and I went back to the same style music playlist as cocktails. After dinner we had the Ashley’s Cakes cutting (so good! I had the almond cake), toasts and then a shoe game MC’d by Brian’s Brothers. I invited all the married couples to the floor to join them for an anniversary dance that ended in a tie at 38 ½ years. I opened the floor to everyone with some Motown and Top 40 that filled it for the next 2.5 hours. I played lots of 90’s, 80’s, current top 40 and some oldies. I even played Paramore for Kristin and her Sister. We ended the night with “Wagon Wheel” by Darius Rucker and finally “Closing Time” by Semisonic that had everyone in a huge circle with their arms around each other singing it. I invited everyone down stairs for a sparkler exit. What a fun night and amazing group to play for! Thank you Kristin, Brian, Betsy and Carrington. 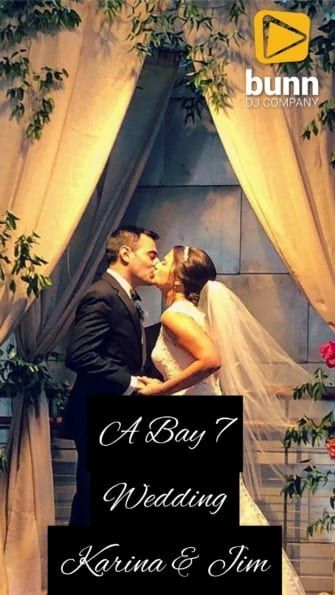 Alice and Pat’s reception took place in Durham, NC at The American Tobacco Campus in the historic Bay 7 venue. We love this place! Not only is it a cool venue, the food is handled by none other than the masters, The Angus Barn! The day started by running the audio for the ceremony. They chose one song, “Life is Better With You” by Michael Franti, for everyone to walk in to, even the bride. That was a new idea, but I liked it! The ceremony was short but sweet and they left down the aisle to “Say Hey” by Michael Franti. After the ceremony, guests went upstairs for cocktail hour as the family photos took place downstairs. I played a mix of Motown classics and some other stuff they chose during this time. The introduction was just Alice and Pat and then they welcomed everyone, which was actually super entertaining. Both of them! Dinner was served, and as usual, it was killer. At the end of dinner, several folks including Alice’s dad and sisters gave toasts, complete with musical interludes. Great stuff! Finally, it was time for the first dance to “Into the Mystic” by Van Morrison. But instead of it just being Alice and Pat, they invited the entire bridal party in with their significant others. Another great idea to change things up from the traditional. There were no other “stops” like cake, bouquet, parent dances, etc. It was just party time from then on! The party closed out with a rousing rendition of “American Pie” and everyone heading to the bar next door for the after party. Looking forward to seeing the images from Riley MacLean. What a night! Karina and Jim had lemons everywhere for their wedding at Bay 7 in Durham NC on July 7th. I don’t believe I have seen the room ever look that beautiful! The ceremony was held on the first floor at the bottom of the stairs. I ran a mic for their officiant and 3 readers. Arioso Strings was there to provide music. After the service the 120 guests were invited to the second floor for cocktails and hors d’oeuvres provided by The Angus Barn. During the cocktail hour I had a mix of standards, Latin samba jazz and classic soul playing. After the cocktail hour, the guests made their way back downstairs to their tables. The room looked just beautiful with floral arrangements by Blossom Bay and designed by newly dubbed “Queen Planner” Carrington from Mclean Events. I introduced just Karina and Jim to the intro of the Core Zee remix of “Doses and Mimosas” by Cherub and they had their first dance to the acoustic mix of “Fire And The Flood” by Vance Joy. It’s such a great version of the song! Their Fathers welcomed everyone and blessed the meal. The plated salads came out and the food stations opened shortly. During dinner was the same mix as cocktails. After dinner we had the toasts and a thank you from Jim. The Sugar Euphoria cake cutting followed to “Wildest Dreams” by Taylor Swift. It was lemon, of course..LOL. Karina joined her Father on the floor for their dance to “In My Life” by The Beatles. It was so sweet! They sang it to each other like I’m sure they did when she was a little girl. I opened the floor to The Hora and a Polka that got everyone up and to the floor within seconds! Some Motown and top 40 followed and kept everyone dancing for the next 2 hours. I played lots of top 40, Latin, 80’s, EDM and some hip-hop at the end. They had their last dance to the regular version of “Fire And The Flood” before everyone left on a bus to the after party. What a fun night and great group to play for! Thank you Karina, Jim, Sarah & Carrington. I had the best time!!! I was so excited to play for Juli, Alex and their guests at The Cookery in Durham on June 10th! 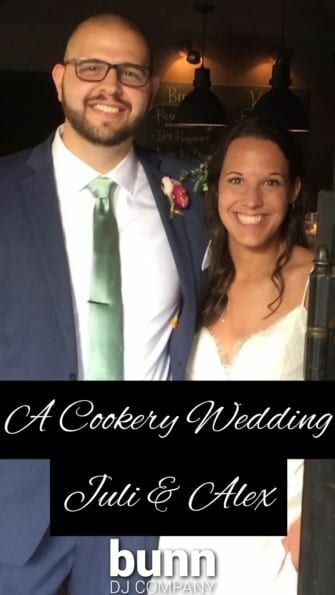 They both work there, so when I was asked to DJ their wedding I was so honored! They have heard every DJ in the area. The ceremony was held in the back garden and I provided mics for their officiant, Elvis Woody and well as one on Alex. I also handled the music. The wedding party walked down the aisle to The Beatles song “In My Life” performed by Jake Shimabukuro. Juli & her Father walked down to “Here Comes The Sun” by The United Guitar Players. After a short ceremony with hand written vows, they recessed to “You’re My Best Friend” by Queen. I invited the 120 guests inside for the cocktail hour. The guests were more than happy to go in and get out of the heat. The cocktail hour was in the front room of The Cookery and I had a mix of classic standards and big band playing. Juli & Alex are really good swing dancers, so this was perfect (as were my black & white wingtips I wore for them). After pics & video were done by Liz from Heirloom Collective & Bradley Reynolds, I invited the guest to the new ballroom for dinner and dancing with help from planners A Swanky Affair. I introduced the wedding party to “Best Of My Love” and Juli & Alex to “Bring Em Out”. Yes!!! They welcomed everyone and thanked them for coming followed by a blessing by Alex’s cousin Jay. The salads were already out and I went into a dinner playlist similar to cocktails. The Durham Catering buffet soon opened in the middle of the room. After dinner we had the toasts, a fun shoe game and the Two Roosters Ice Cream truck opened outside. We had the first dance and parents dances before opening the dance floor to everyone. Juli & Alex had their dance to the 2016 acoustic version of “Baby I Love Your Way” by Peter Frampton. I loved the original version of this, but may even love this more! Juli’s Father joined her for their dance to a mix I did of “The Way You Look Tonight” by Sinatra and then “Givin It Up” by Delbert McClinton. They had a blast dancing to them. Alex & his Mother danced to “I Hope You Dance” after that. I invited the married couples to the floor for a shared dance with Juli & Alex to “Say You Won’t Let Go” with the longest married couple at 46 years! Some Motown and top 40 kept everyone on the floor. The floor was packed all night to oldies, top 40, 2000’s pop sings and even some hip-hop at the end of the night. We ended the night with “New York, New York” and a ribbon wand exit right before the rain came. Thank you Juli, Alex and Amanda!! I had a blast!! 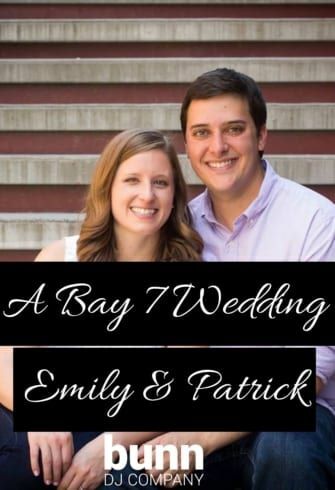 I was so thrilled to be Emily and Patrick’s wedding DJ on May 26th at Bay 7 in Durham NC! They are such a nice couple!! Their ceremony was held on the main floor at the bottom of the stairs. Their officiant, Tom, had also married Emily’s other two sisters. That is so special! Arioso Strings was there to provide music and I ran Tom’s mic. After the ceremony the guests were invited to the cocktail hour on the 2nd floor. During the cocktail hour I had a mix of rock, country, classic soul and standards playing. The staff flipped the downstairs for dinner while photographers Robin Lin and Stacy got shots of the wedding party inside and outside. After the cocktail hour, the 160 guests made their way back downstairs to their tables with help from planner Sally Oakley. I introduced Emily and Patrick and they came down the stairs to loud applause. They had their first dance to “Then” by Brad Paisley followed by a welcome by her Father. The food stations and ZimZoom photo booth opened and I went back to music. After dinner we had the toasts and cake cutting to “Shotgun Rider” by Tim McGraw. Emily and her Father had their dance to “I Hope You Dance” by Ronan Keating. Such a great version of this song! Patrick escorted his Mother to the floor for their dance to “My Wish”. I opened the floor to everyone with some Motown and Top 40 that soon filled it. For the next 2 hours they danced hard to 80’s, 90’s 2000’s, top 40 and some oldies. We ended the night with a last dance to “Sweet Caroline” but I knew they weren’t ready to leave yet. Sure enough, a loud “One More Song” chant started and I dropped “Tearin’ Up My Heart” by N’Sync. I invited the guests back upstairs for the sparkler exit. Thank you so much Emily, Patrick and Sally! I had an absolute blast!! Brandon and Karl had me as their wedding DJ for both ceremony and reception on April 6that Durham’s Cotton Room. 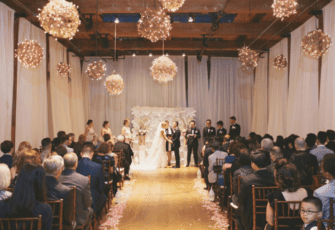 The ceremony was held on one side of the room with floor to ceiling windows lining the wall. The other side was floor to ceiling white linens. It is just beautiful there, especially with floral arrangements by Petal & Oak! They had music performed by harpist Amy Cortis and I ran mics for their minister and readers. After the ceremony the guests were invited to the bar for cocktails and passed hors d’oeuvres. During the cocktail hour I had a mix of 80’s & 90’s rock playing mixed with some oldies. After pics were done by photographer Peter Somers and the room was ready, the white linens opened and I invited the 120 guests to their tables. I introduced the wedding party to “Celebration”. They took their seats and Karl welcomed everyone. Brandon’s Father toasted the couple and the food stations opened. During dinner I played a mix of 70’s through current top 40 and rock. After dinner they had their first dance to “Thinking Out Loud” followed by the parents dances. Brandon and her Father danced to “You Are The Sunshine Of My Life” and Karl & his Mother joined them after a minute. Before opening the dance floor we had the Simply Cakes cutting to “Sugar, Sugar” by The Archies. I opened the floor with some Motown, 70’s and top 40 that people danced to all night. We ended with a college fav for Brandon and her friends, “Rebecca” by Pat McGee Band. I LOVE that song and haven’t played in in years!! Their last dance followed to “A Thousand Years” and a sparkler exit from the front of the building. Thank you so much Brandon and Karl and congratulations! I never met Debra and Alex until I was the wedding DJ at the JB Duke Hotel Wedding Venue in Durham (Click here to visit the JB Duke Hotel site) on their wedding day, but felt like we have been friends forever. They are that nice! Their ceremony was held in part of the ballroom and officiated by Reverend Ed Sansbury with music provided by the violin and guitar duo Violet Bell. After the ceremony, the 200 guests made their way to the lobby for more music by Violet Bell while the staff flipped the room and I set up. This was my first time at JB Duke Hotel and I am absolutely in love with it!!! 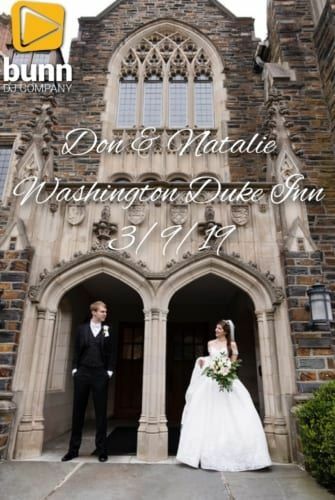 When pics were finished by photographers Rebecca and Brian Mullins (and the Duke game was over), the doors to the ballroom opened and the guests found their seats. I introduced only Debra and Alex. They came in to a cover of The Specials “No Wondering Why” and they danced in and continued to on the floor like they do in their kitchen to this song. They now had what was their second dance as husband and wife to “You Are The Best thing” by Ray LaMontagne. After that Debra made a toast in honor of her late Father and Alex danced with his Mother. They had their dance to “Child Of Mine” by Carole King and Debra’s Mother welcomed everyone. The salads and entrées came out and I had a mix of blues, indie rock and classic rock playing. After dinner we had some big group pics taken and the cake cutting to “The Way I Am”. A Few toasts followed and then the dance floor erupted to “The Hora”. Nothing like 180 guests doing the Hora within 2 minutes! After that, some Motown, oldies, 70’s 80’s and top 40 kept them dancing for the next couple hours. I even got to see Alex’s parents do a few ballroom dances! We ended the night with “Wagon Wheel” and finally the original recording of “Make You Feel My Love” by Billy Joel. Thank you so much for everything Debra and Alex and congratulations!! Photo courtesy of Brian Mullins Photography. Hilary and Minh had both their ceremony and reception at Durham’s Cotton Room and I was honored to be their wedding DJ. As a wedding venue in Durham, I highly recommend it. Their wedding ceremony was held in the middle of the room and surrounded by white linens and a backdrop made of white paper flowers. It was so beautiful! Their music was performed by pianist Michael from Save The Date Music and he did an amazing job! Minister Katherine Edwards held the service. I always love working with her! They also had an interpreted for the guests from Vietnam and streamed it live for those who could not make it. After the ceremony the 140 guests made their way to the cocktail hour while the staff flipped the room for dinner and dancing. During the cocktail hour I had a mix of standards, R&B and acoustic rock playing. Photographer Hung Phung got some great pics of the wedding party in front of the white paper flower wall and also outside during the cocktail hour. When pics were done and the room was set, the white linens opened and the guests found their seats for dinner. I introduced Hilary’s Parents along with the wedding party to the Alesso remix of “Something Just Like This” by Chainsmokers. Hilary and Minh were introduced to “Symphony” by Clean Bandit as they made their way to the head table. Her Father welcomed everyone and the salads and entrees came out. During dinner I played the same playlist as cocktails. After dinner we had several toasts and the dances. Their first dance was to “The Way You Look Tonight” by Frank Sinatra followed by the Father/Daughter dance to “Daughters” by John Mayer. Minh danced with his Grandmother to “Because You Loved Me” by Celine Dion. After that we had the cake cutting to “Sugar” by Maroon 5 but the guests couldn’t wait to hit the floor so started dancing. I had 50 people dancing during the cake cutting! So great!! That never happens. After that I mixed into “Uptown Funk” that filled it for the rest of the night. We paused for the bouquet toss to “Diva” and then back to dancing to some EDM, Hip-Hop and a few K-Pop song. We ended the night with a shirtless groom on top of his buddies shoulders dancing to “Marry You” by Bruno Mars and a sparkler exit from the main floor. Thank you so so much Hilary and Minh and congratulations!! Californians Anita and Matt chose Durham’s very hip 21C Museum Hotel for their ceremony and reception on November 25th. It has to be one of the coolest venues in the area and they are one of the coolest couples I have played for. The ceremony was held in the main ballroom and I provided a mic and music for that. The room looked beautiful with floral arrangements by Bowerbird Flowers and amber uplighting by me. As the 120 guests arrived I had classical music playing. Grandparents, Parents, Groom & Groomsmen & Bridesmaids all came down to a separate classical piece and Anita to “Your Hand In Mine” by Vitamin String Quartet. After a short ceremony officiated by Ana Quintana they recessed to “God Only Knows” also by Vitamin String Quartet. Planner Amanda Scott from A Swanky Affair invited guests to the second floor for the cocktail hour. I had a mix of indie rock and classic rock playing while they toured the exhibit and enjoyed refreshments. After pics were taken by Rachel and Bill from Thirteenth Moon Photography the guests made their way back downstairs to the ballroom for dinner and dancing. I always LOVE working with them! I introduced the wedding party to “Can’t Rock My Dream Face” by Umphree’s McGee. Anita & Matt came in and right to the floor for their first dance to “Let’s Stay Together”. Matt welcomed everyone and the buffet opened. During dinner I played more indie and classic rock. After dinner we had the toasts and Suzie Q Cake cutting to “Cake” by Flo Rida. Anita joined her Father on the floor for their dance to “Into The Mystic” and Matt & his Mother danced to “I Will”. I LOVE both of those songs!! We had an anniversary dance to Nat King Cole’s “L.O.V.E.” with the winners married 40 years. I opened the floor to everyone with some Motown and Top 40 for a few songs that filled it. Then, mixed into some high energy crossover dance music and the first set of EDM (Electronic Dance Music). We paused for the bouquet & garter tosses, then back to dancing until the end of the night. We ended the night with the last dance to “Real Real Love” by Father John Misty and lots of sour feet from dancing. They had a sparkler exit from the front of the building. Thank you Anita, Matt & Amanda!